Awaking earlier than I wish I had to from the nice, comfortable, queen-size bed, I prepared myself for what I knew would be a long day. The departure of Grand Coulee started with a nice 400ft + climb (not what I was hoping for). At the top, a building tailwind blew at my back (a west wind!). This, I knew, would be of great benefit today. The winds aided my travel across the flat land of eastern Washington. In Wilbur (the town I would have stopped at if I rode like a maniac yesterday) I stopped to refill my water supply at a gas station, and was asked by a man filling up with gas where I was headed to. Upon my reply of Minnesota, he asked if I was raising money for something. I didn’t even finish explaining to him the orphans that I am trying to help before he handed me $20 for them. There are so many good people out here. The rest of the day entailed crop fields, some cookies and lemonade at a rest area about 10 miles out of Davenport, a short stop at a beautiful park in Davenport, a nice cherry shake at Dean’s drive-in in Reardan, and arrival at my wonderful hosts for the night in the 2nd largest city of the tour so far, Spokane. Bjorn and Julianne were wonderful people who also have a passion for touring. It is always good to talk to others who understand what bicycle touring entails. They were great hosts and I am grateful for the stay. Desolation and wasteland. That’s all there is between these two locales of civilization. This morning I stocked up on water, knowing there would be very little between here and my next destination. A stop at the Spanish grocery store in town yielded two bananas, one of which I consumed, and I was off. 38 miles and a couple thoughts of quitting later, I found myself cruising down into the grand city of Grand Coulee. I knew from looking at my maps along the way that Hometown Pizza was right along the Bridgeport highway that I was taking into town – I stopped there and was glad that it wasn’t a hallucination after staring forward into the unrelenting sunlight all day. The calzone I ordered filled me up, and my phone and camera finished charging at the outlet on the table next to me just as I was done eating, but the next town, Wilbur, seemed too far away to get to yet today (20 miles which isn’t much but after a scorching 5 1/2 hours in the sun on a bike with a few hills it seems like eternity). 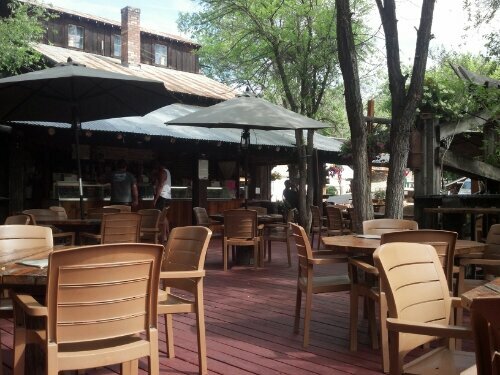 The waitress notified me of a couple of places to stay in town. Not liking the idea of paying for a motel, as I haven’t on the trip so far, I succumbed and called all 3 places. The Trail West motel is where I ended up, and by 4:30 p.m. I was in my room and relaxed. This stay at the motel in Grand Coulee ended up being extremely beneficial and worthwhile. The hardware store had an inner-tube that I purchased to replenish my dwindling supply. The local Safeway helped me replenish my on-bike food supply and get a few microwave meals for the night. And, most importantly, the Grand Coulee creamery provided an excellent cookies and cream waffle cone that I enjoyed. Rebecca, the hostess, was fascinated at the trip I was taking. We had good conversation. She also mentioned the famous light show here at the dam in Grand Coulee. 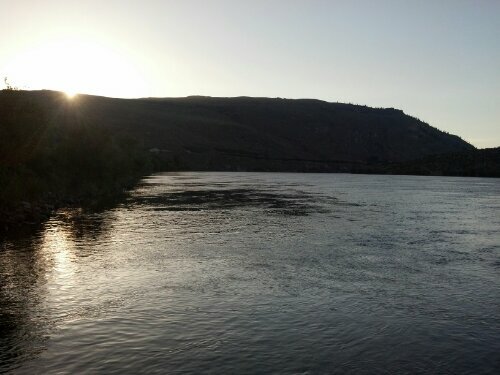 So, the stay here in Grand Coulee has been quite grand after all. The motel is very comfortable. Knowing that tomorrow will likely be a long day, this was likely a good move. After the brutal day in the mountains, a brutal day in the sun burned me. Despite the fact that the elevation was relatively flat today, the unceasing burden of the sun, with no cloud cover in the skies, all in this high desert area with no shade and few trees made the day very tough. I stopped in Winthrop at the library for a quick wifi stop and phone charge. On the east side of town, I had to stop at the appeal of the shops on main street. I purchased two fresh muffins and had a nice ice cream waffle cone. 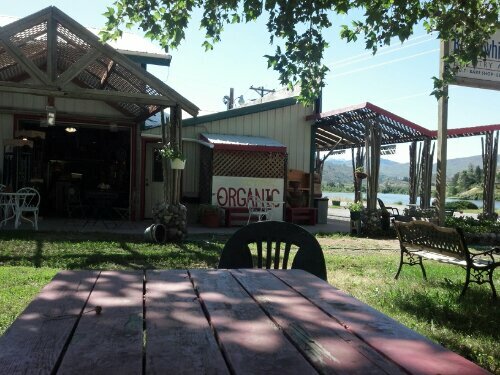 After Winthrop, the next stop was at the Black Bird cafe in Twisp. From there, the Methow River led me through the small establishment of Carlton, all the way to lake Pateros. 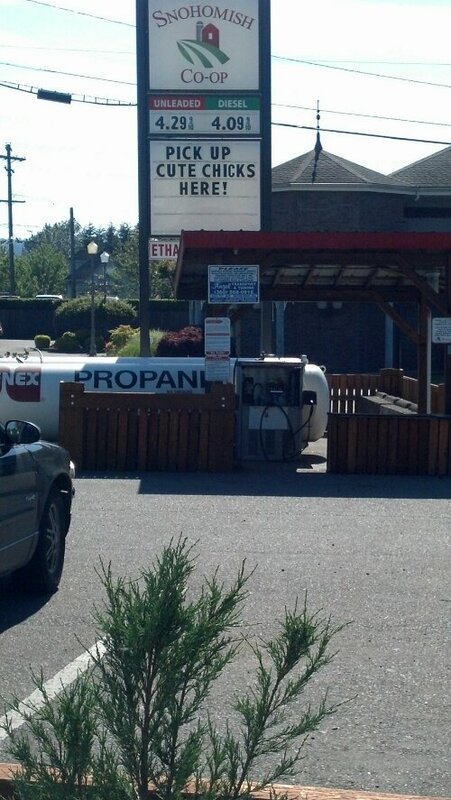 This oasis was welcomed warmly. I discovered the Rest Awhile stop as I entered Pateros. A wonderful little bakery/knick knack shop. The $4 Subway lunch in Brewster gave me enough energy to cycle on next to the Columbia River, all the way to Bridgeport. Arrived at the park and was happy to see shower facilities available. 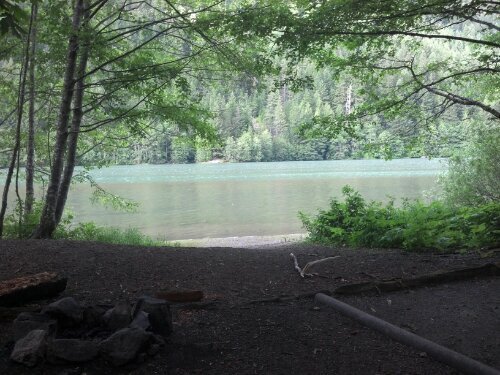 I pitched my tent, utilized the shower, started a campfire, and cooked my Ramen noodles. That was enough for the day. Other than the vicious chipmunk that ate it’s way into my bag of bread while I was setting up my tent yesterday evening, and the abnormally rocky, hard surface where I set up the tent, the stay at Colonial Creek campground was successful. While packing up my belongings this morning, preparing for what I knew would be a tough day, I spotted another bicycle touring enthusiast passing by on the campground trail. Seeing me as well, he stopped. The man’s name was Earnest. After talking to him for a few minutes, I learned that he has toured Africa, South America, Central America, Australia, now the U.S. and he is waiting for his passport to head to Canada. Just talking to this guy was amazing. It is always nice to see others who live out this passion of touring. By the time 3:00 p.m. rolled around, I was not nearly half as far as I wanted to be at the end of the day, I was out of water (that I had in bottles and my camelbak), plus I ate the last of my Ramen noodles around 4:30. I was drained. But I didn’t let it affect me mentally. In all of the research, planning, and talking with other long-tour cyclists, the biggest thing they all stressed was staying mentally clear. So I did what I needed to do. I knew that water wasn’t an issue, for there were mountain streams and creeks from glacial melt almost every mile. So, I grabbed my campstove, boiled a pot of water from Porcupine creek, drank some and filled my water bottles. After resting till about 5:00, I noticed some other cyclists on their way up too. They were from Minnesota as well! 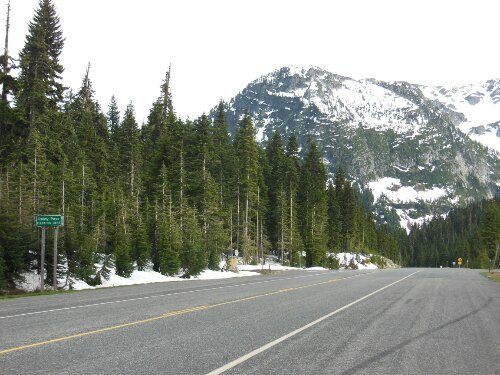 I took a quick look at the elevation map they had and noticed that much of the climbing was done until I reached Rainy Pass, which was only a few miles ahead. 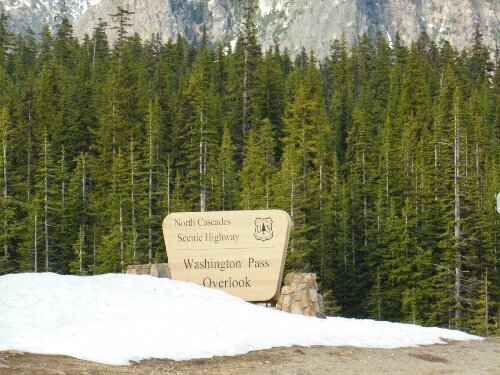 Then I would only have an 800ft climb to get to Washington Pass, at an elevation of over 5400ft. This unexpected greeting from the fellow cyclists really gave me more motivation. I pedaled on. My sunburned arms and face emanated a distinct discomfort that I have learned to accept from days of cycling in the sun. Stiffness in the lower back and hands started to become more pronounced. I buckled down and found more energy than I thought I could muster. Rainy Pass, elevation 4855ft, was conquered at about 6:15 p.m. Now all I had was 800ft of climbing and about 5 miles before it was time to reap the downhill of all the climbing I worked for all day. 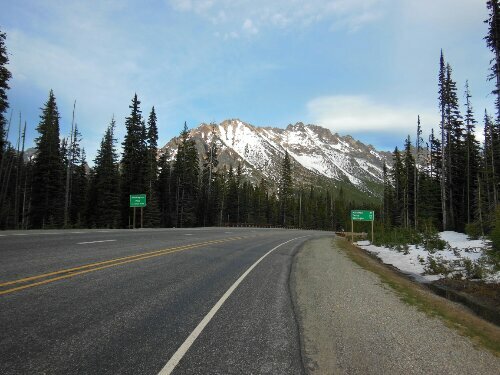 The work and agony of the climb is what I payed to see sunset in Washington Pass as I coasted for 10 miles at speeds up to 34mph. Riding the decline into the Mazama river valley easy of the mountains, I recalled there were a few free places to stay, one of them being the Bike Barn. 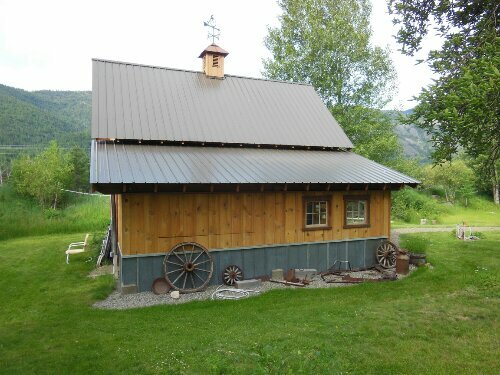 Here, cyclists can stay next to the big trademark barn. There is an outdoor shower (with warm water! ), drinking water, an outhouse, and lights to aid in setting up your tent. All of which I utilized and was grateful for. One other cyclist was here, none other than Earnest who I had met in the morning! He shared some chilli and we talked some more for a while. Funny how things work! I fell asleep within 20 minutes after pitching the tent and throwing everything inside. This may have been the hardest day of the tour. It was an early start to a wonderful day today. Awoke early to send my friend off on his flight to the east coast, I left the house around 5:40 a.m.
After some turmoil making sure my tires were pumped up sufficiently and double-checking my route out of downtown, I was on my way. On my way north on the scenic Centennial trail, I called some distant relatives of mine who live in Stanwood. They met me in Arlington for lunch at the Blue Bird cafe. I met numerous nice people on the Centennial trail. All of them wished me safe travels and a few even had me write down this blog for them. All of this good food is spoiling me. But little did I know, more food was to come. During lunch, they handed me the business card of their son who lives in Sedro-Woolley, right along my way. 5 hours later I found myself there with a nice bed, a warm shower, and hot food. I cannot thank them enough for their hospitality. I did get my first flat of the trip today, only a few blocks from the house where I stayed. I took care of that and ended the evening eating Cascade cherries and looking at the mountains in the bug-free Washington air.